AFP Consulting, LLC - Jock Tax Professionals | What is the Jock Tax Index? The Jock Tax Index (JTI), presented at the 2015 MIT’s Sloan Sports Analytics Conference and featured on Bloomberg Television’s Market Crashers, is a proprietary tool which allows both teams and player representatives involved in contract negotiations to compare the true value of any potential contract proposal to the same monetary offering from every other team in their league. The JTI ranks each team according to the federal, resident and nonresident state and city income tax liability based on their home and away schedule and places this information into a usable index. In addition, the index allows users to discount future cash flows based on either inflation or opportunity cost. Signing an unrestricted free-agent contract includes many variables. First, the determination of market value, either through comparative analysis or by the marginal revenue produced approach. Considering the availability of data and the restrictions in both the National Basketball Association and the National Hockey League’s Collective Bargaining Agreements (CBA), the market value of the top tier players can be determined fairly quickly. However, the market value is only one important variable needed to be considered by the player and their representative. The financial and tax implications of the city a player signs in also needs to be taken into account. In negotiations, knowledge is power for both the athlete and the organization. By quantifying the financial and tax implications for multiple offers, an accurate after-tax present value or true value of a contract can be expressed. A player, and their representative equipped with this information can evaluate each team’s proposal, based on the city and state of the team along with the duration of the contract and timing of the payments. For teams, quantifying the monetary leverage of their unique tax situation can systematically adjust their contract proposal depending on the individual player and the terms offered by opposing teams in competition for that player’s services. While teams and representatives can negotiate the total salary of a contract, it’s the true value of a contract that provides the greatest insight in determining the value of each individual contract proposal. In order to determine this true value, three measurements need to be taken into consideration – tax liability, buying power and the time value of money. While all athletes incur federal tax liability on their earnings, their exposure to state and local taxes will be dictated by a team’s home and road schedule. For example, in this upcoming season, an athlete who plays in the National Basketball Association (NBA) will potentially be taxed in up to 28 different states and cities. Those playing in Major League Baseball (MLB) will be exposed to 21 different jurisdictions and a National Hockey League (NHL) player will potentially play in 22 US jurisdictions and possibly four additional Canadian provinces. After analyzing each team’s home and away schedule, a player’s unique tax liability can be determined. How an individual team’s unique tax situation affects the true value of a contract can be expressed in these two examples. 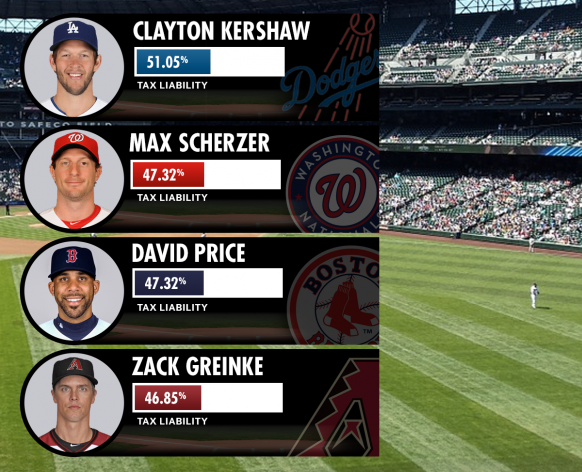 Clayton Kershaw who is a resident of California faces the highest percentage of tax, amongst the four comparable pitchers. He retains only 48.95% of his income while Zack Greinke, signing in Arizona, will retain 53.15%. 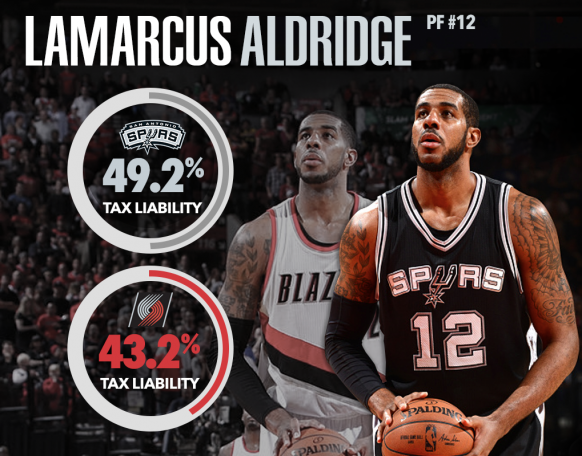 LaMarcus Aldridge, by signing in San Antonio, would be able to keep an additional 5.94% of his salary as opposed to signing in Portland, Oregon. While tax implications are a main component to affecting the true value of a player’s salary, there are also financial considerations which devalue the overall contract’s monetary value. Once tax implications have been calculated the final component in the JTI is the time value of money. The general principle that the value of a dollar received today is more valuable than a dollar received tomorrow – because of inflation or the opportunity to invest that dollar – plays a significant role in analyzing the overall value of a long term contract. The greater the term of the contract as well as the amount of income deferred into the future will cause the overall devaluing of the contract’s true value in today’s terms. It is important for teams and agents to understand the unique tax consequences that professional athletes face. The JTI allows both sides of a negotiation to quantifying the advantage or disadvantage based on the jurisdiction of the team and the terms of the contract offer. Therefore, allowing the team or agent to systematically adjust their contract proposal depending on the teams in competition for the player’s services. For more information on how the JTI can benefit your negotiations please do not hesitate to contact Alan Pogroszewski at AFP Consulting, LLC, (585) 705-3405.